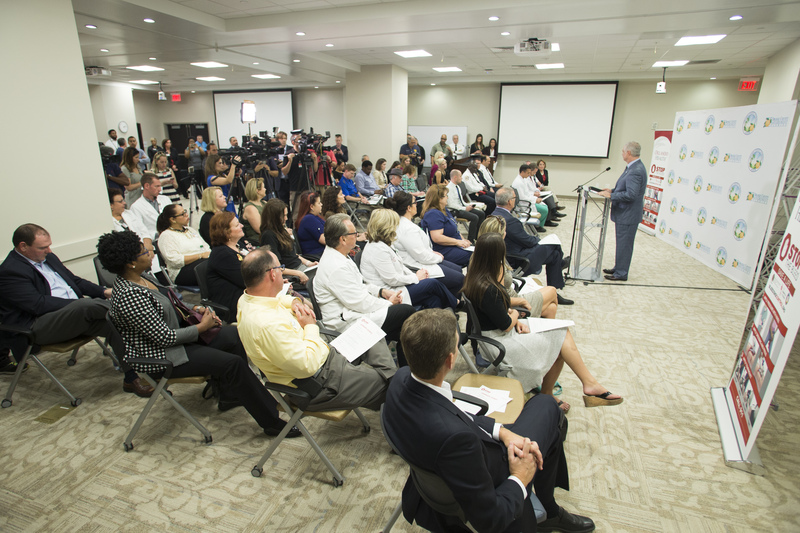 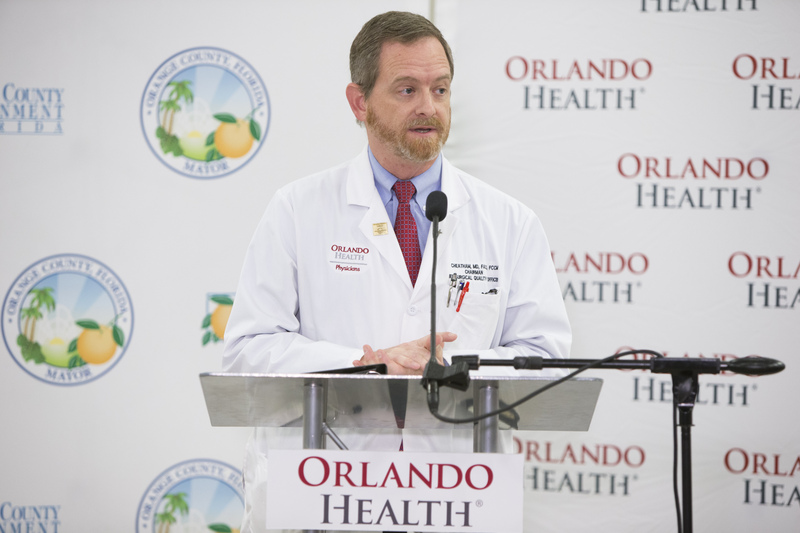 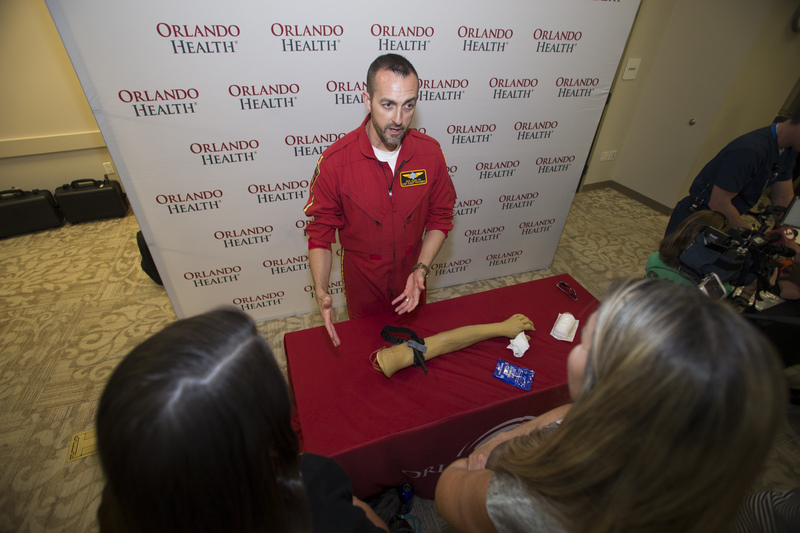 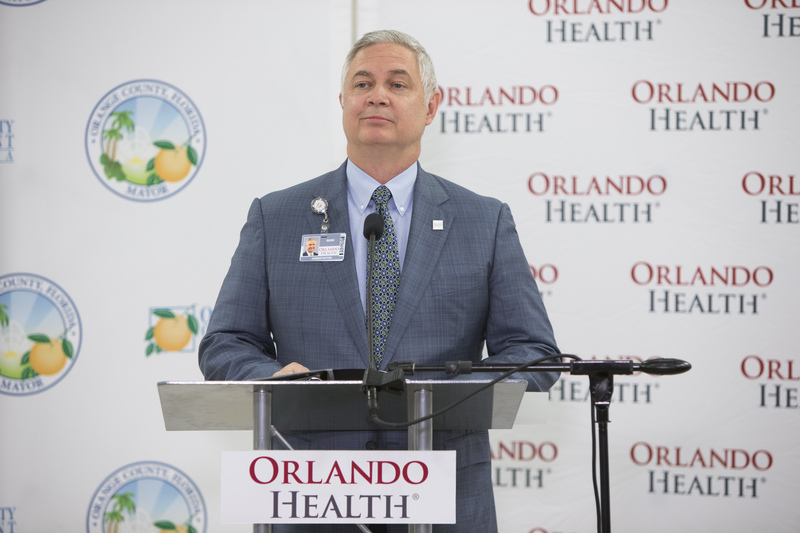 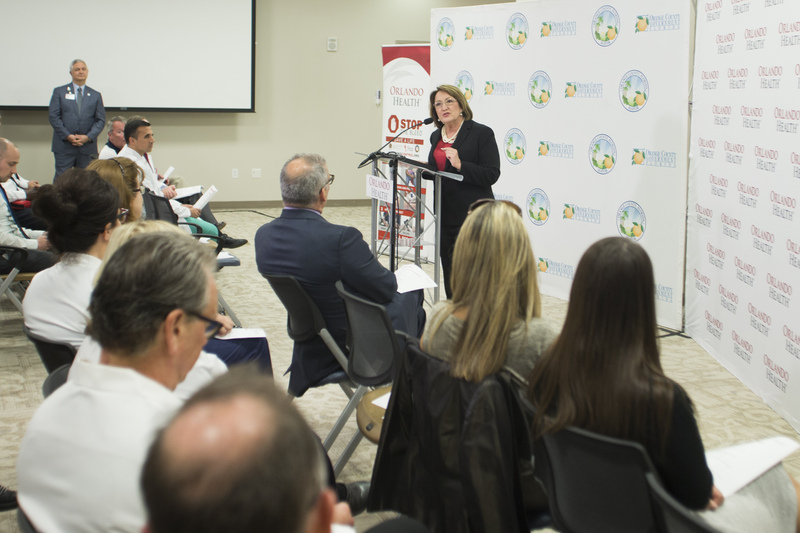 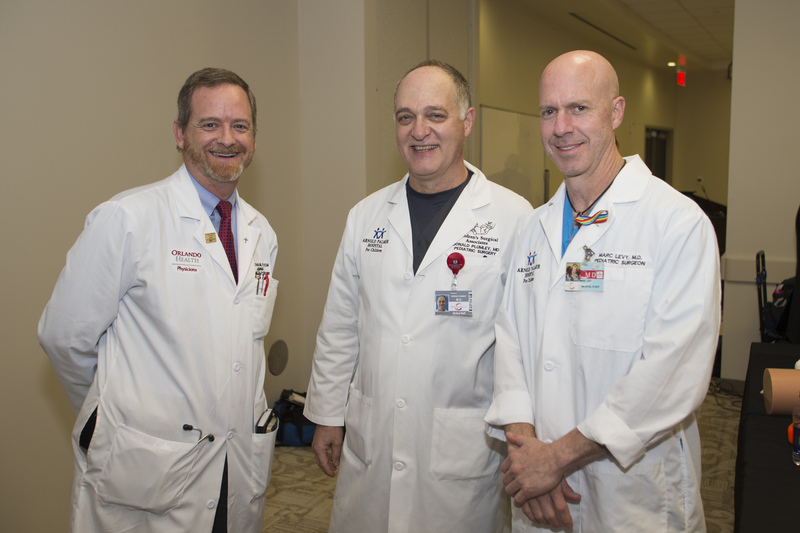 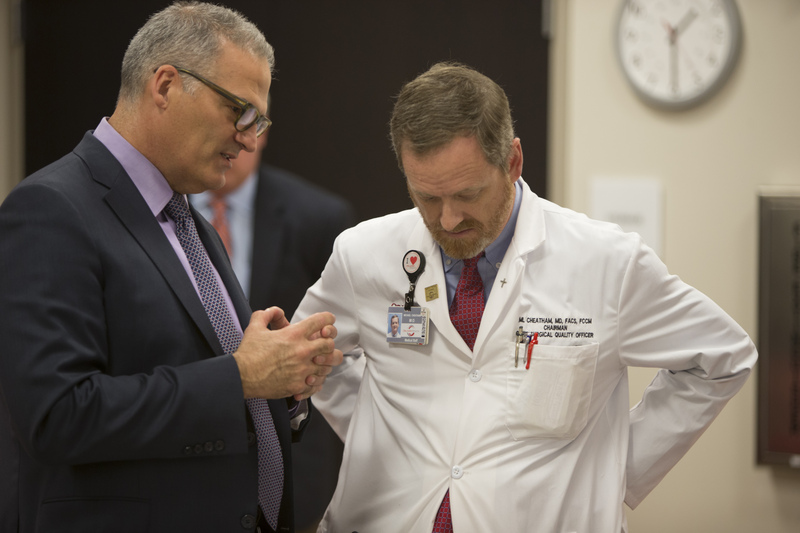 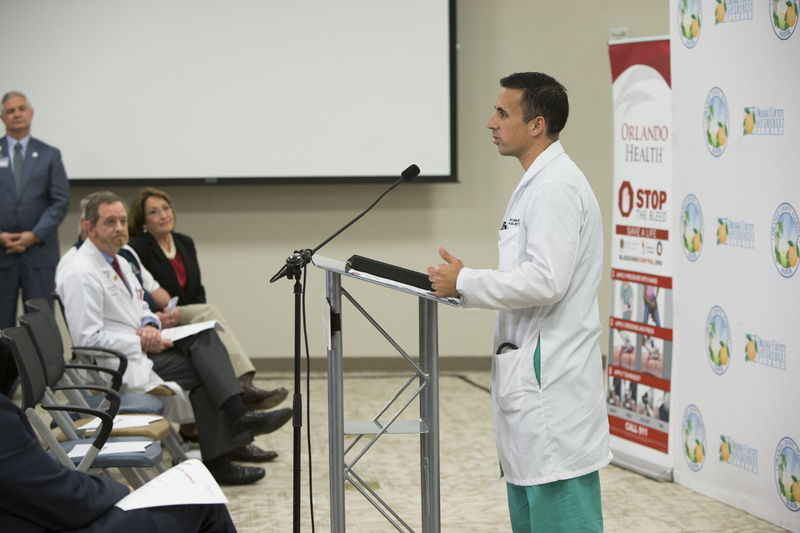 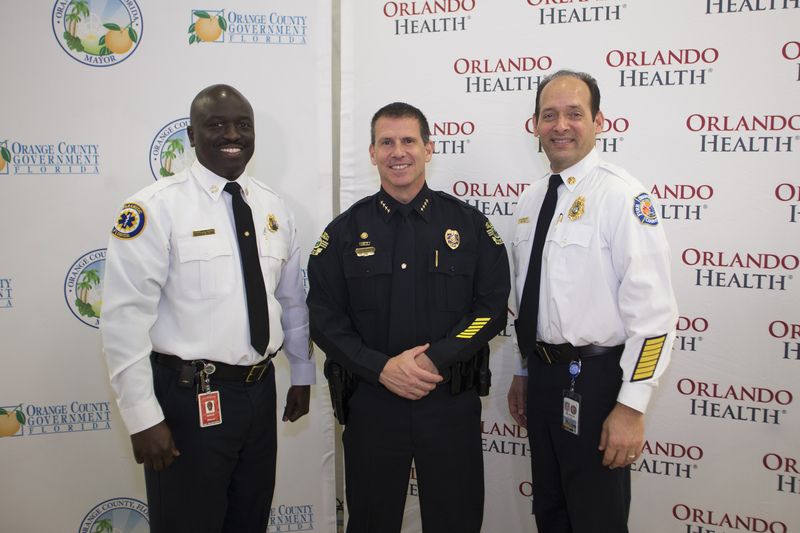 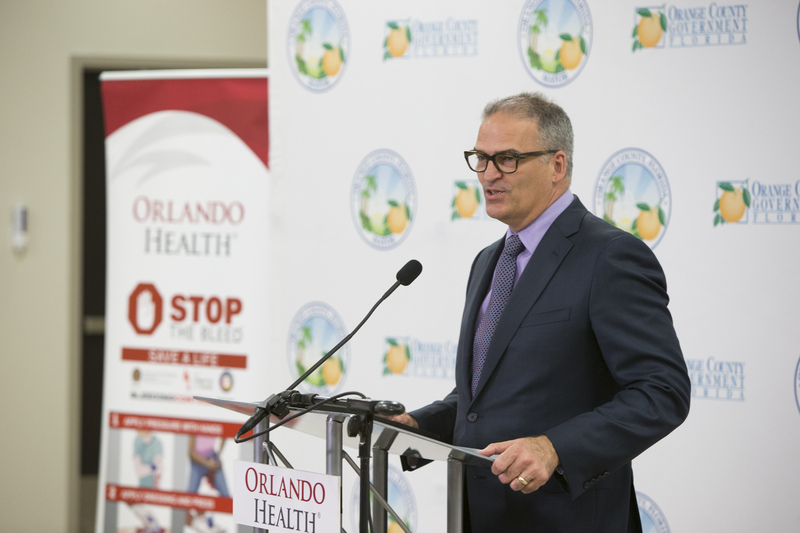 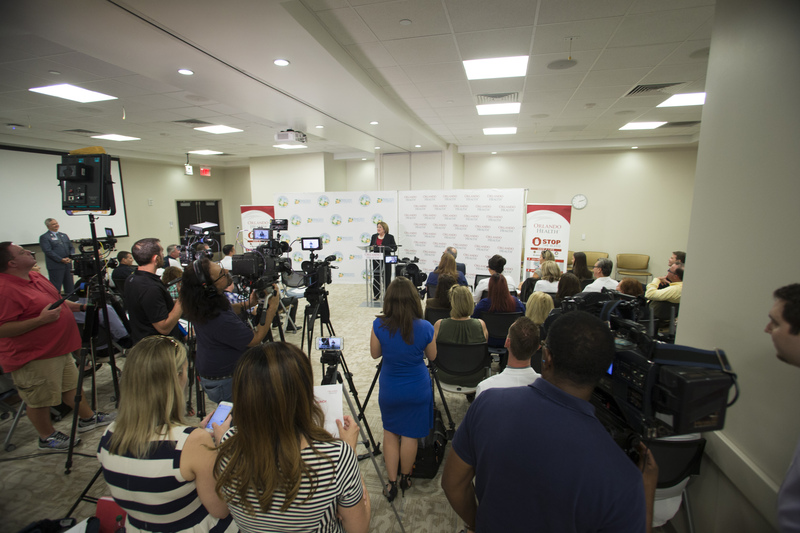 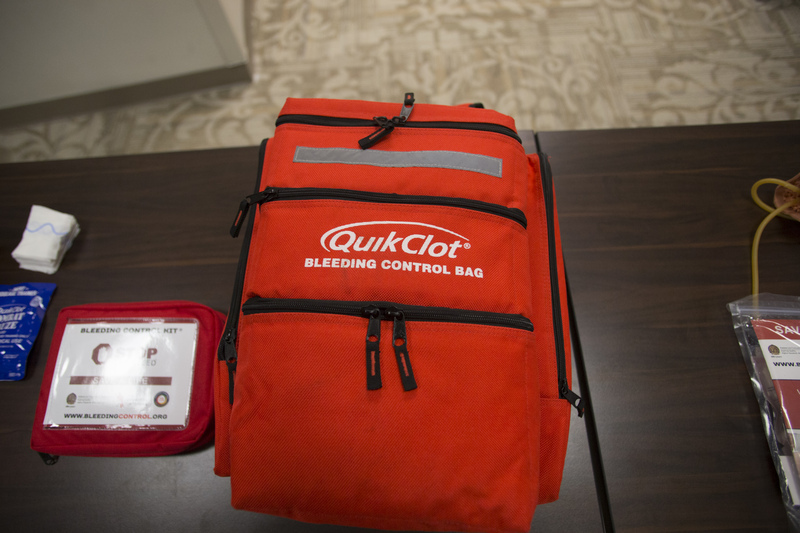 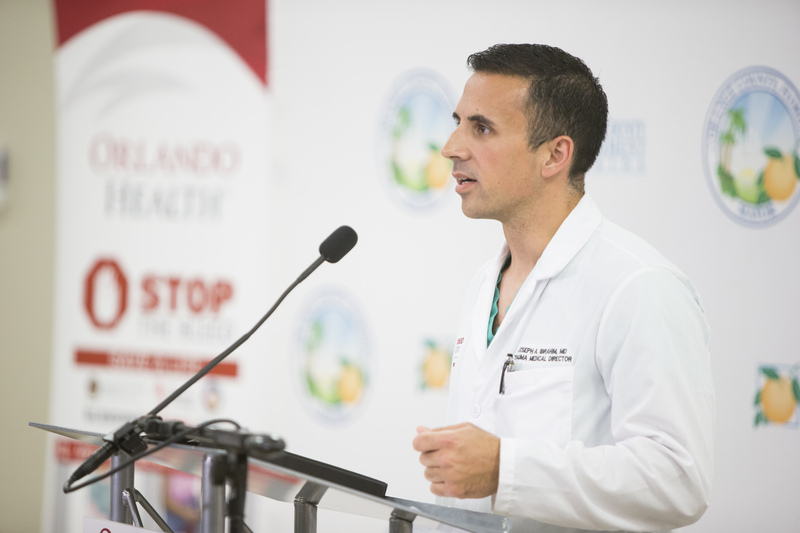 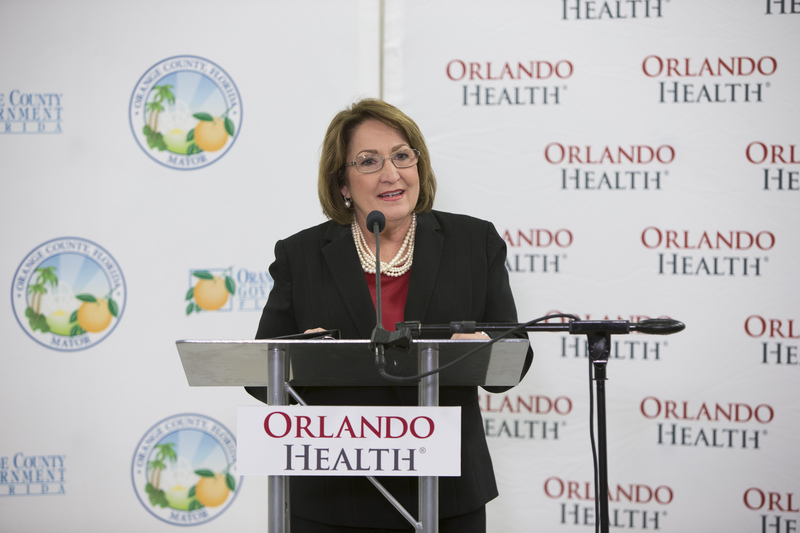 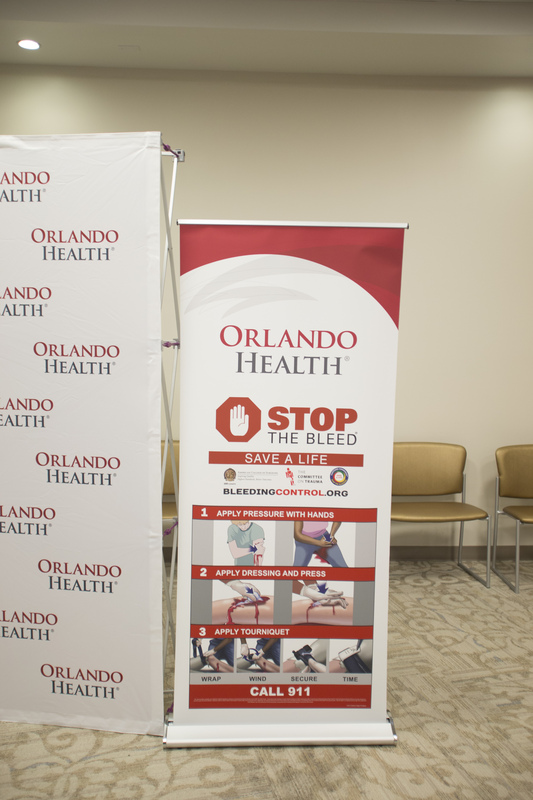 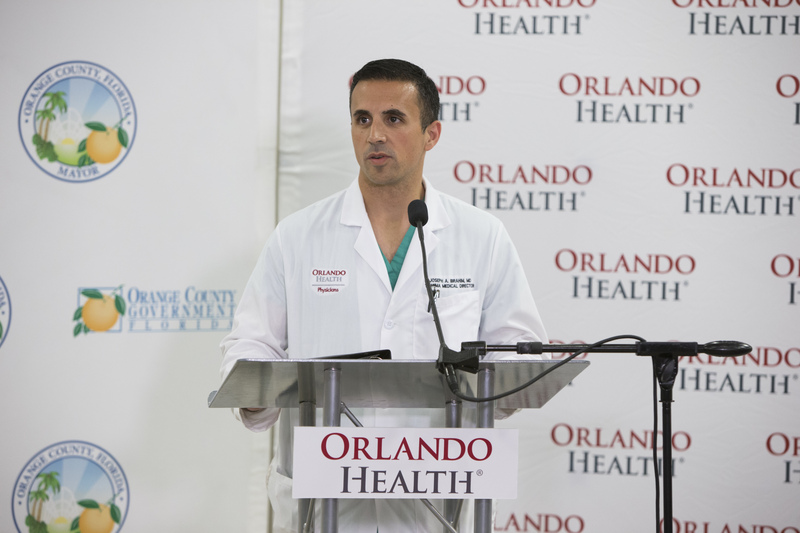 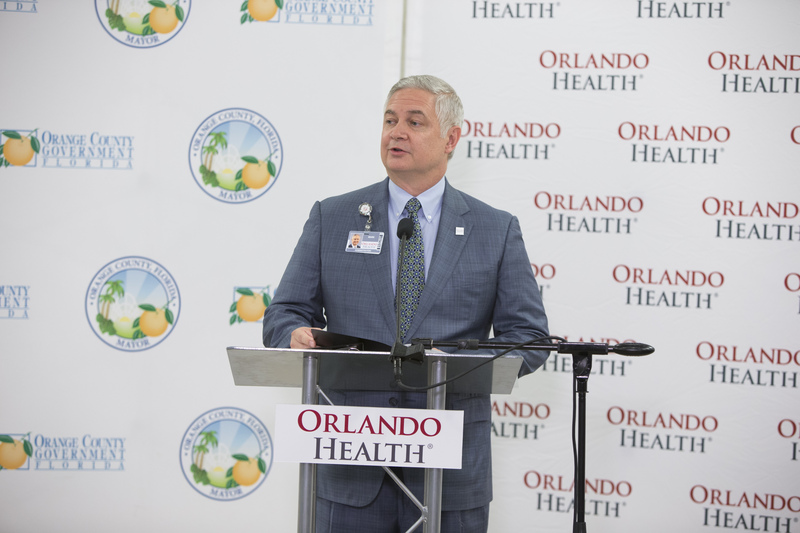 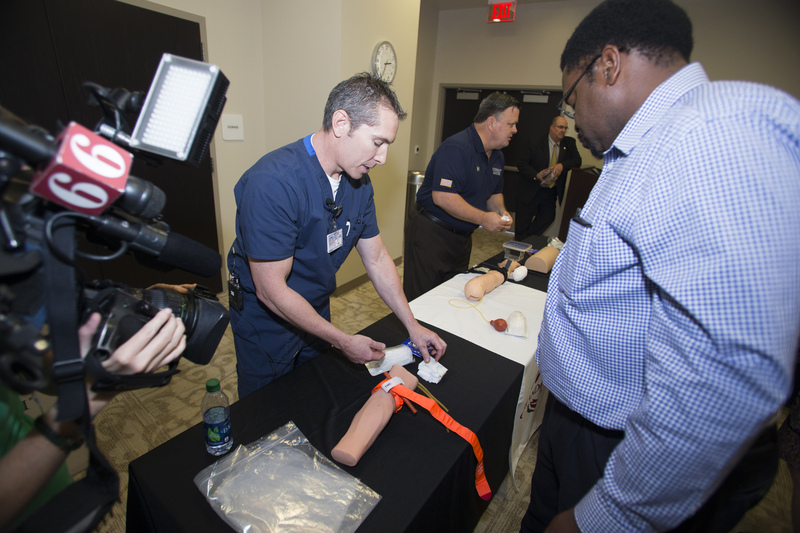 Orlando Health Level One Trauma Team and Orange County Government jointly announced the local launch of “Stop the Bleed,” a national training model proven to save lives. 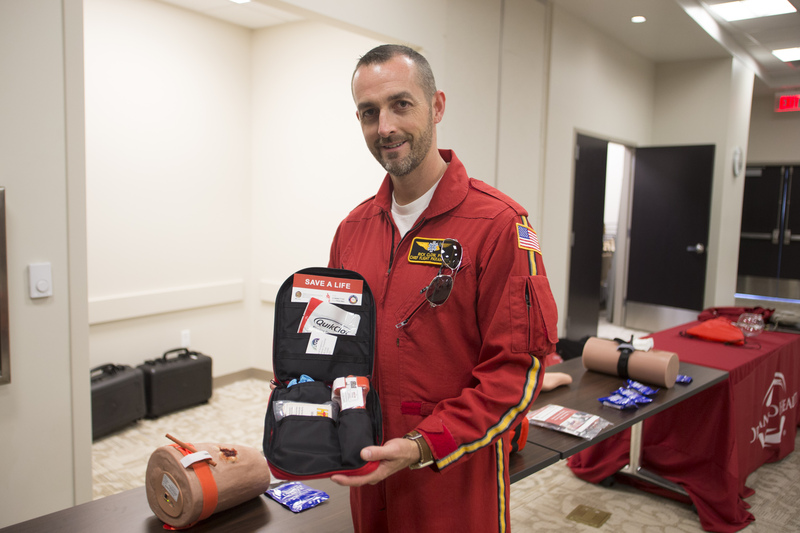 The training was launched in response to the 2012 Sandy Hook Elementary School tragedy in an effort to improve survivability from man-made or natural mass casualty events. 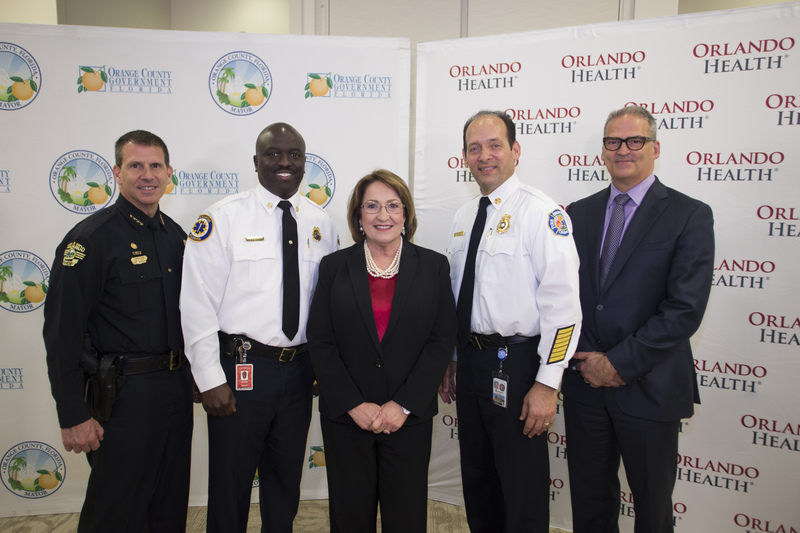 Top leaders and public safety officials joined Mayor Jacobs, including Fire Chief Otto Drozd III, City of Orlando Mayor Buddy Dyer, Police Chief John Mina and Fire Chief Roderick Williams. 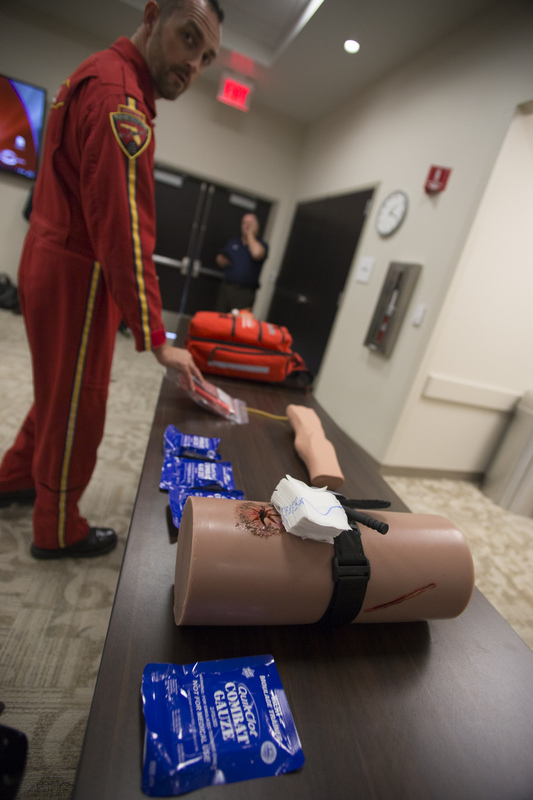 After the formal campaign announcement, those attending got a firsthand look at the ABCs of bleeding response, similar to what training participants will observe and practice. 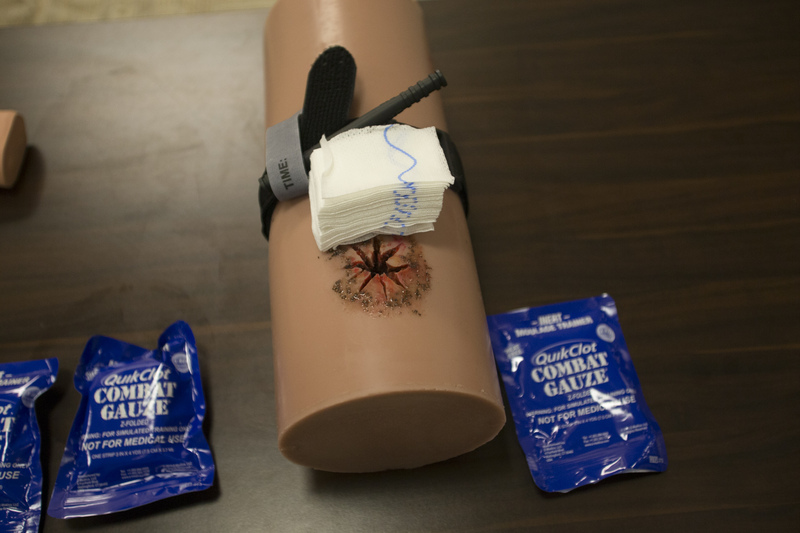 The ABCs of responding for bleeding: A for Alert, call 9-1-1; B for Bleeding, find the bleeding injury; and C for Compress, apply pressure by various techniques including a tourniquet or packing the wound. 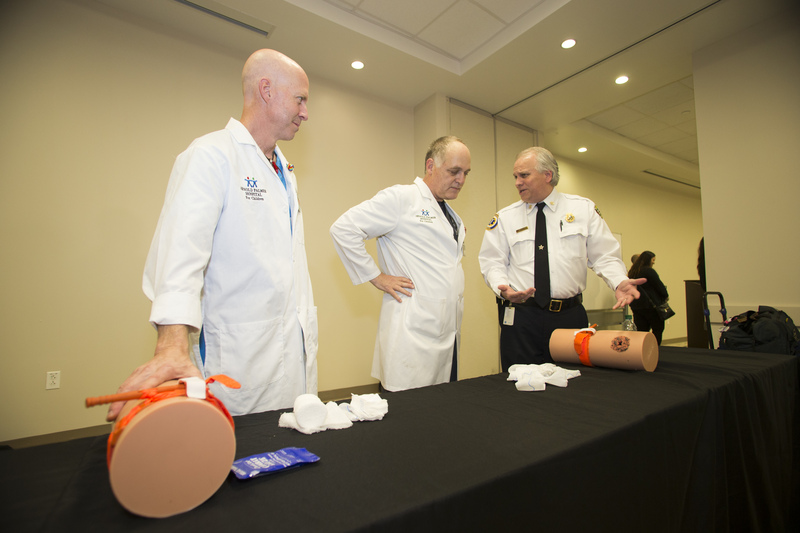 “Good Samaritans should always dial 9-1-1 first, but by equipping the everyday person with basic training on how to render aid to someone who is experiencing significant blood loss can be the difference between life and death, or even quality of life,” according to Dr. George Ralls, who serves as Orange County’s Emergency Medical Services (EMS) Medical Director. 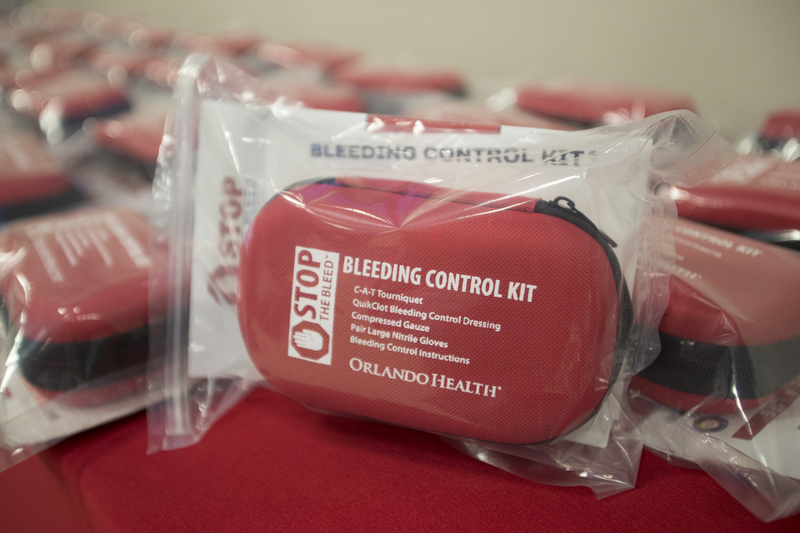 While Orlando Health’s Trauma Team will deliver the medical training component of Stop the Bleed, Orange County’s Office of the EMS Medical Director will help reach the community and facilitate training for local businesses, organizations and individuals in a manner similar to CPR training outreach efforts. 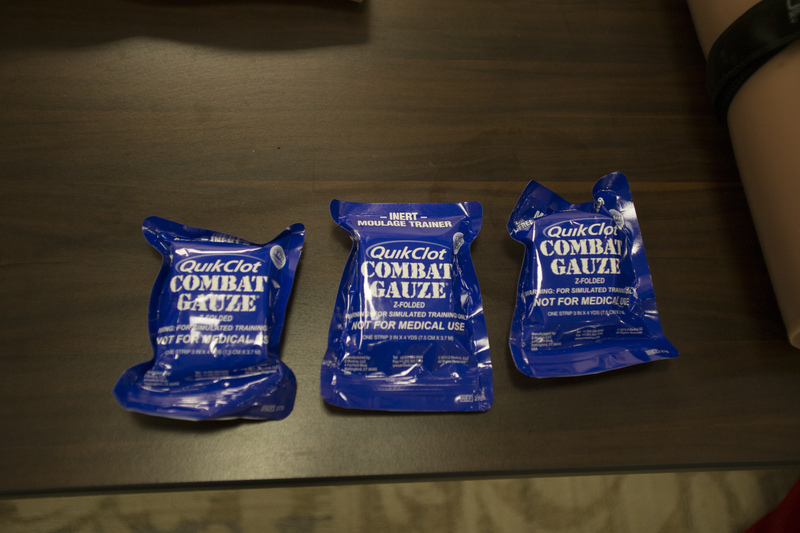 Through Stop the Bleed participants will learn how to use what is commonly referred to as a B-Con Kit, a kit that includes: gloves, tourniquet(s), gauze coated with special medication to help with clotting, pressure bandage/compression application and would be a tool available to a person rendering aid while EMS is en route. 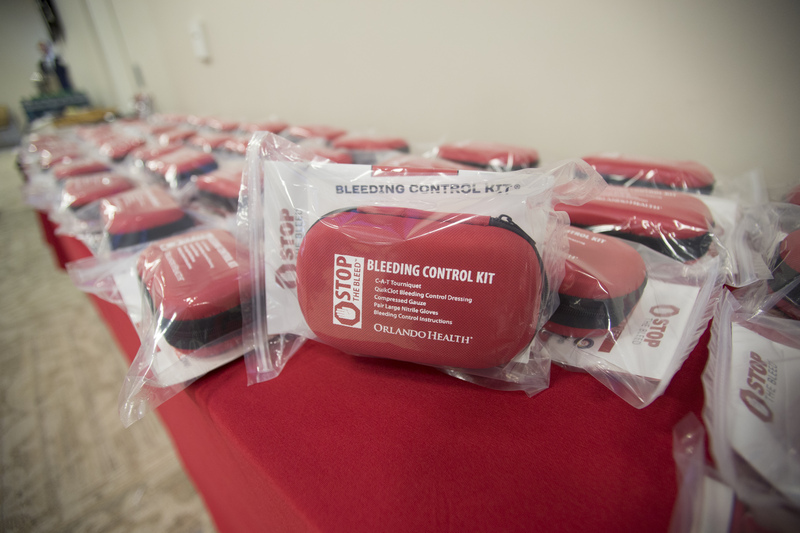 Stop the Bleed classes range from one to two hours long and are provided at no cost to the participant. 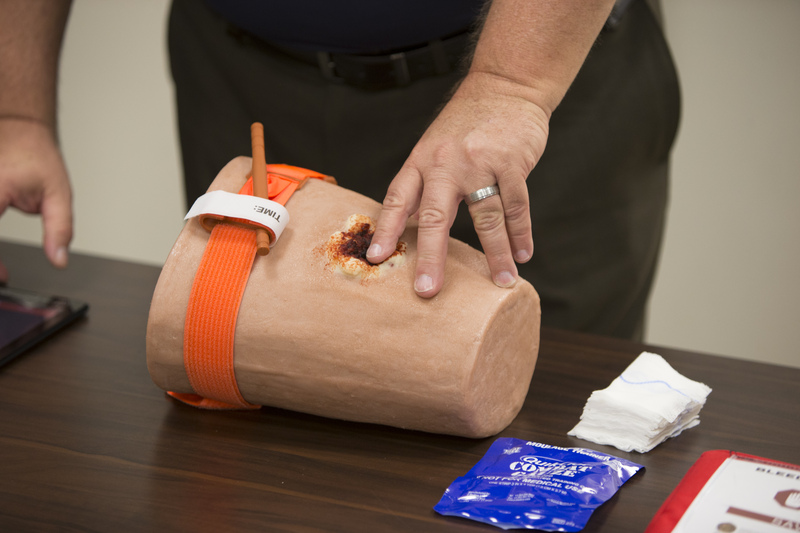 Local classes are expected to be available to the public within the next few months. 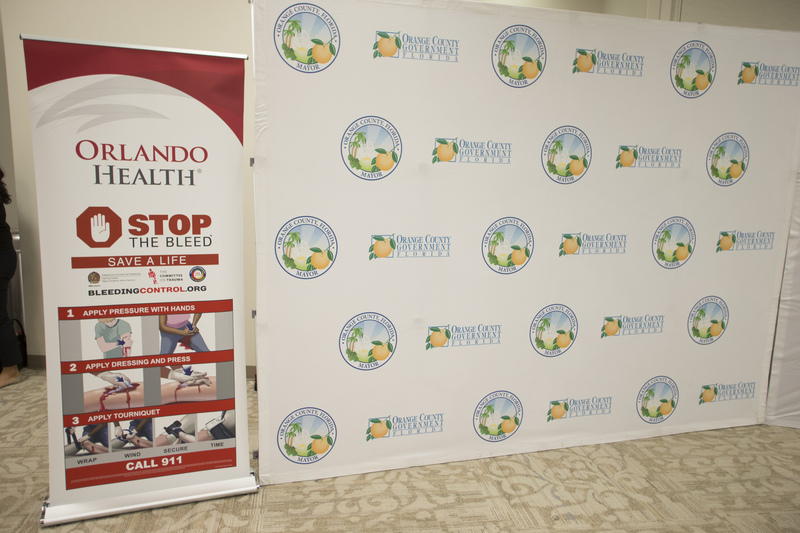 For additional information, send an email to R-StopTheBleed@orlandohealth.com. 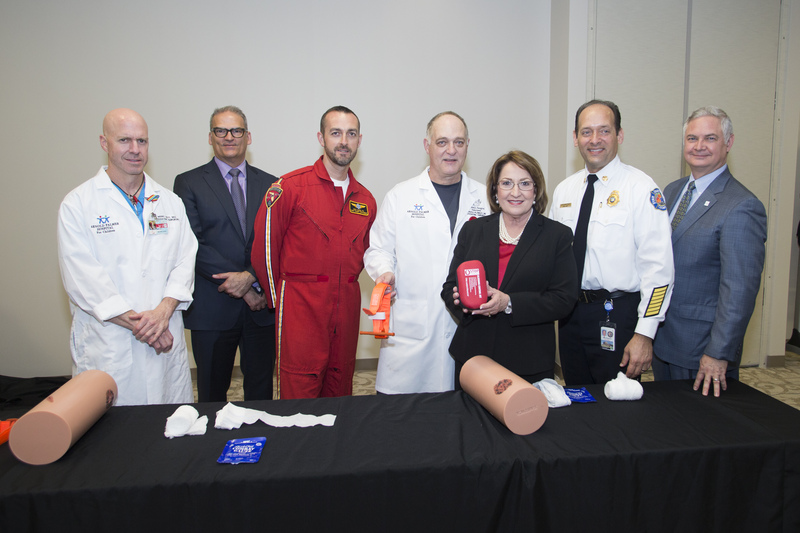 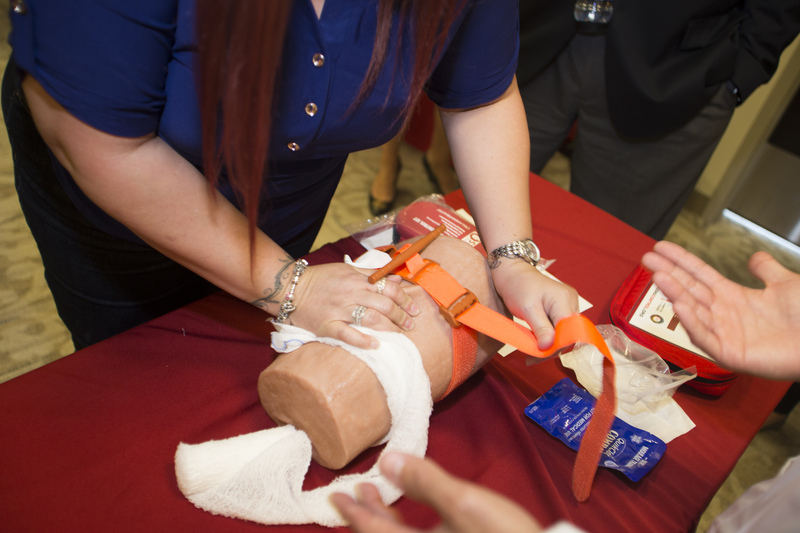 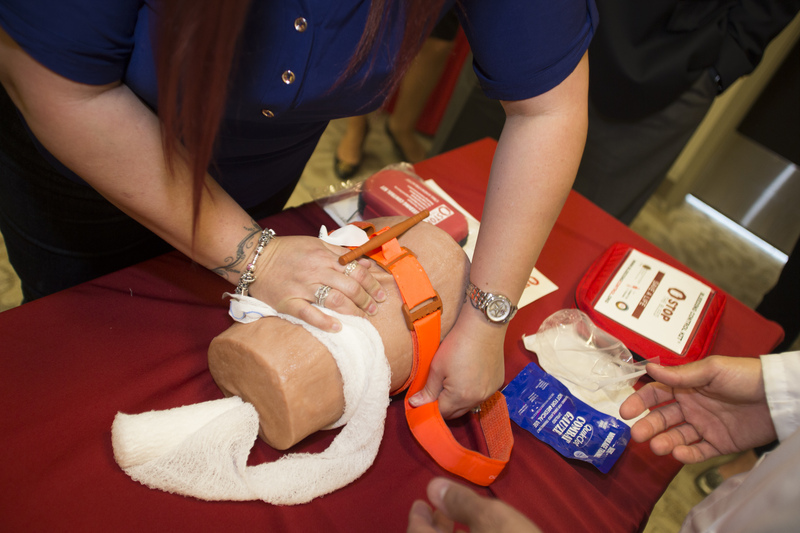 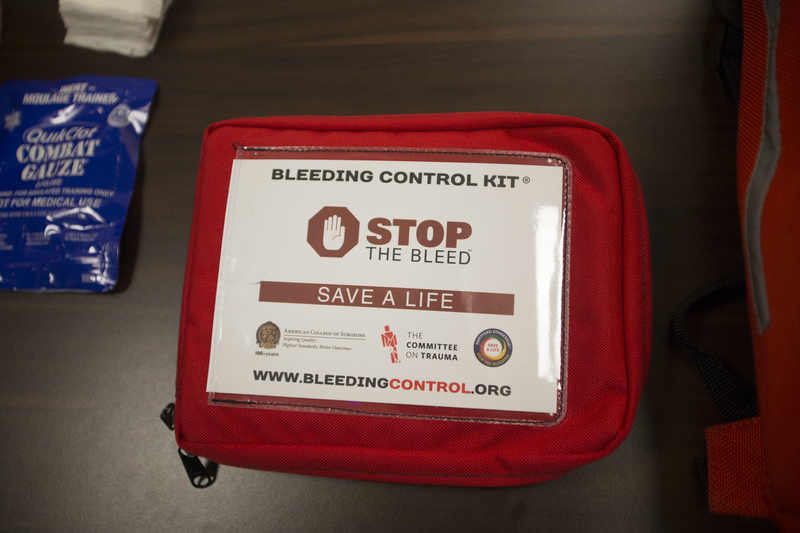 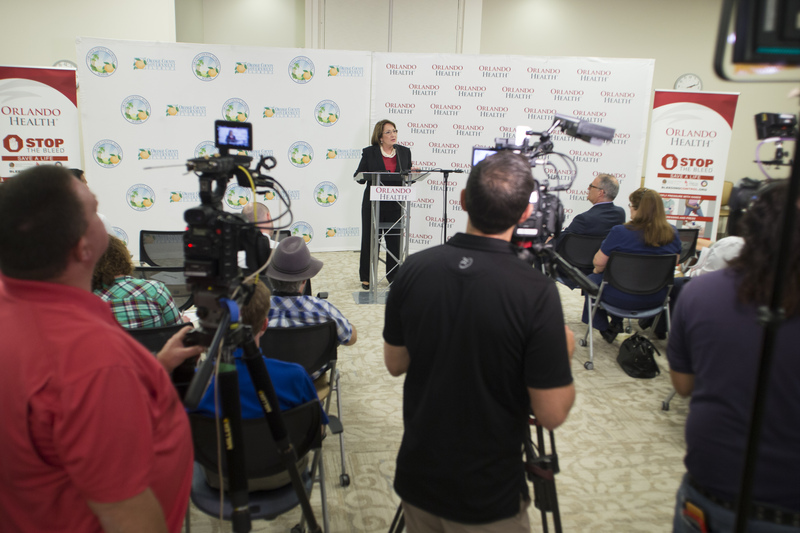 To view photos from the Stop the Bleed news conference, visit Mayor Jacobs’ Flickr album.